This spicy, citrussy recipe is James Martin’s take on a dish made by chef Stephen Terry at The Hardwick in Abergavenny. 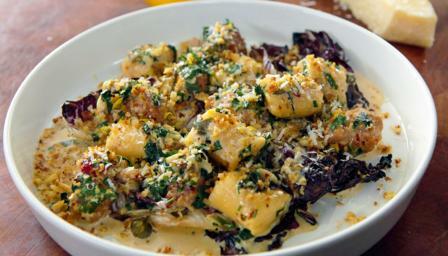 For the gnocchi, preheat the oven to 170C/340F/Gas 3½. Rub the potatoes in the oil, then pile the rock salt in the centre of a baking tray and place the potatoes on top. Bake in the oven for 1½ hours, or until tender. Set aside until cool enough to handle. Cut the potatoes in half and scoop out the flesh, then pass it through a potato ricer or sieve into a large bowl. Season, to taste, with salt and freshly ground black pepper, then beat in the flour and egg yolk until the mixture comes together as a soft dough. Turn the dough out onto a lightly floured work surface and divide it into quarters. Roll each piece of dough into a long sausage and cut into 2cm/¾in pieces. Lightly pinch each gnocchi in the middle so that the ends are slightly wider than the middle. Lower the gnocchi into a large pan of boiling, salted water and boil until the gnocchi bob to the surface. Remove from the pan using a slotted spoon, then transfer to a bowl of ice-cold water, to cool. Meanwhile, for the sauce, heat half of the butter in a frying pan over a medium heat. Add the sausage meat and fry until golden-brown all over. Add the shallots, garlic and chilli flakes and fry for a further 2-3 minutes. Pour in the chicken stock and bring to the boil. Reduce the heat until the mixture is simmering and continue to simmer until the volume of liquid has reduced by half and the sausagemeat is cooked through. Add the cream, drained gnocchi, capers, parsley and lemon zest and continue to simmer for 2-3 minutes, or until heated through. Heat a griddle pan over a high heat. Rub the radicchio wedges with the olive oil, then place onto the griddle pan and fry for one minute on each side, or until lightly charred. Heat the remaining butter in a small frying pan over a medium heat. Add the breadcrumbs and fry until golden-brown, then season, to taste, with salt and freshly ground black pepper. Tip the crumbs on to kitchen paper to cool. To serve, arrange the charred radicchio wedges on a large serving plate. Spoon over the gnocchi and sauce. Garnish with the Parmesan and the crunchy breadcrumbs.